Chrome, IE8 and Firefox 3.1: how do they stack up? with new browser versions and Safari 4 benchmarks added in. On the face of it, all three browsers are excellent - but there are big differences in the way they do things, and even bigger differences in the strain they can put on your system. We benchmarked all three programs on a 2.66GHz Core 2 Duo machine packing 2GB of RAM and Windows Vista Ultimate - but as that's a fairly speedy machine we also blew the dust off our trusty and desperately underpowered Acer Aspire to see how they coped on that. Wherever possible we've compared like with like, and for the sake of clarity we'll avoid terms such as "OmniBox" (Chrome) or "Awesome Bar" (Firefox) when we're comparing different browsers' address bars. We believe in calling a spade a spade, not an OmniShovel or MegaSpade. There's been a lot of talk about Chrome's minimalist appearance, but it doesn't make that much difference to the amount of space the browser actually takes up. Disable Firefox's and IE's status bars - Chrome doesn't have one - and Chrome's header is a half-tab shorter than IE and the same size as Firefox. Had Google gone for something other than THE WORLD'S BIGGEST FONT in the address bar, the difference would have been more pronounced. In fact, Chrome's slight space advantage disappears completely when you maximise it. Its address bar and tabs remain at the top of the screen, whereas in full screen mode IE8 and Firefox get rid of absolutely everything. One thing Chrome has done is simplified the traditional combination of address bar and search bar. Instead, you use the same box to type URLs and search criteria; if it's the latter, Chrome comes up with some helpful suggestions. IE8 does the same but keeps a separate search box just in case, while Firefox sticks with URLs and previously visited pages in the address bar and search suggestions in the search bar. That doesn't mean Chrome doesn't have some nifty tricks. Click on the spanner icon and choose History to see a Google-style list of the pages you've visited along with a prominent search box for finding exactly what you want, and when you create a new tab there's an Opera-style collection of nine thumbnails to show you your most commonly visited sites along with your most recently added bookmarks. We particularly liked the ability to delete a particular day's browsing history without getting rid of everything else, and the ability to resize on-screen text input boxes is brilliant. As with Firefox and IE you can re-arrange open tabs by dragging them around, but Chrome also enables you to drag a tab over the desktop. Firefox does this too, but where Firefox then saves the page as a link Chrome opens it as a new browser window. We prefer Chrome's approach. It's not all good, though. Bookmark management is non-existent, Chrome doesn't appear to know what an RSS feed is let alone offer any features to deal with one, and where IE and Firefox can zoom in and out of entire web pages Chrome merely makes the text bigger or smaller while leaving images intact. 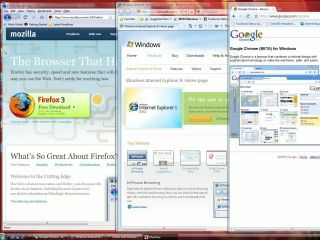 There's no doubt that Firefox is the Swiss Army Knife of the internet, boasting an unrivalled collection of extensions and themes - although to be fair, IE is catching up with a decent collection of Toolbars and Extensions in the Internet Explorer Gallery. With Chrome, expandability is limited to the usual content plugins - Flash, Acrobat, Silverlight and so on. Extensions are on the to-do list.